What lies at the heart of humanity's capacity for evil? Any tenable answer to this age-old question must include an explanation of our penchant for objectifying and dehumanizing our fellow human beings. 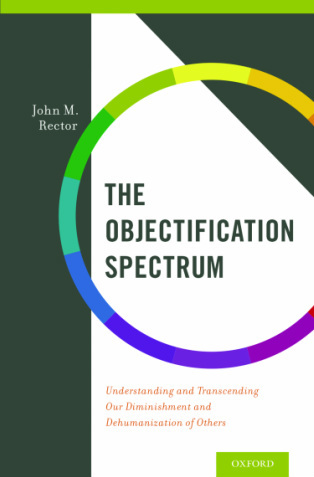 The Objectification Spectrum: Understanding and Transcending Our Diminishment and Dehumanization of Others draws upon timeless wisdom and gripping historical accounts to propose a new model of objectification. Rather than offering a narrow definition of the term, the author explores objectification as a spectrum of misapprehension running from its mildest form, casual indifference, to its most extreme manifestation, dehumanization. Using vivid examples to clearly demarcate three primary levels of objectification, the author engages in a thoughtful exploration of various dispositional and situational factors contributing to this uniquely human phenomenon. These include narcissism, the ego, death denial, toxic situations, and our perceived boundaries of self, among others. Rector then gives us reason to hope by orienting his model of objectification into a broader continuum of human capability--one that includes a countervailing enlightenment spectrum. Gleaning insights from classic philosophy, the world's five most prominent religious traditions, and current social science research, he examines the best antidotes humankind has devised thus far to move us from casual concern for our fellow human beings toward interconnectedness and, ultimately, unity consciousness. Broad in scope and deeply penetrating, The Objectification Spectrum advances the conversation about the nature of human evil into personally relevant, potentially transformative territory.